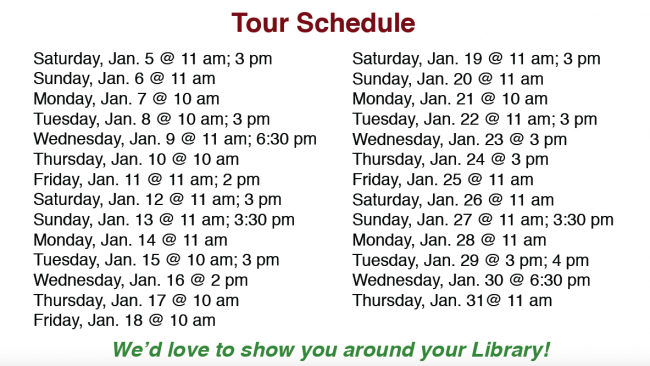 Book a Library Orientation Tour! Welcome all new and returning students! Come take a tour of your Library! Learn how to use the library website, how to contact your subject librarian for research help, and where to go for writing and IT help. Discover the best places to study in the Library, learn how to book group study rooms, find out about library computers, printers, laptops, 3D printing, Wi-Fi, and much more! Not only will you learn about your Library's services and resources by attending a Library Orientation Tour, but your name will also be entered in a draw to win a $15 gift card to Indigo! Tours start on Saturday, January 5 and are available throughout the month. Tours leave from the Service Desk, last 30-40 minutes, and are limited to 6 people per tour so be sure to book early! Let us help you with your academic journey! We have resources and information for all students! And, we'd love to show you around!